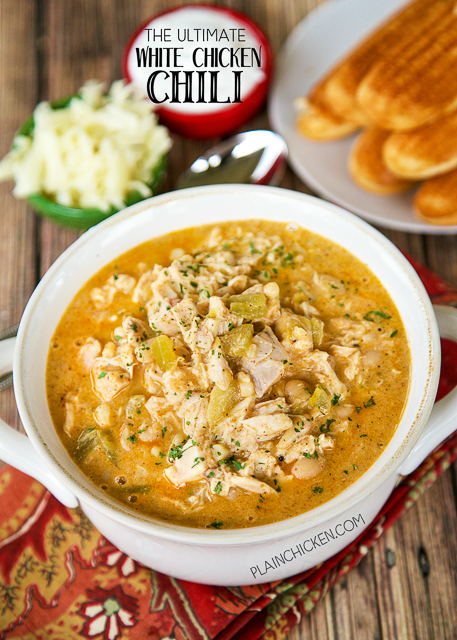 I called this The Ultimate White Chicken Chili because it really is the best of the best White Chicken Chili. It is also a great way to use up any leftover turkey from you holiday meal tomorrow! We both absolutely LOVED this chili. It has tons of great flavors and only takes a few minutes to make. The key to getting this on the table in under 20 minutes is using a rotisserie chicken. I used a whole rotisserie chicken, you could definitely use all turkey or a combination of cooked chicken and turkey. You are basically just heating everything up in the pot and digging in! All you need is some yummy cornbread and you are set. This makes a TON! It is perfect for watching all the rivalry games this weekend in college football! I am making a big pot for us to watch the Iron Bowl on Saturday. As I said, this makes a ton. You can freeze any leftovers for a quick meal later. In a Dutch oven melt butter and stir in flour. Cook for 2 minutes. Gradually whisk in chicken broth and half-and-half. Bring to a boil and cook for 2 minutes, until thickened. Add remaining ingredients and cook for an additional 10 to 15 minutes, stirring occasionally. 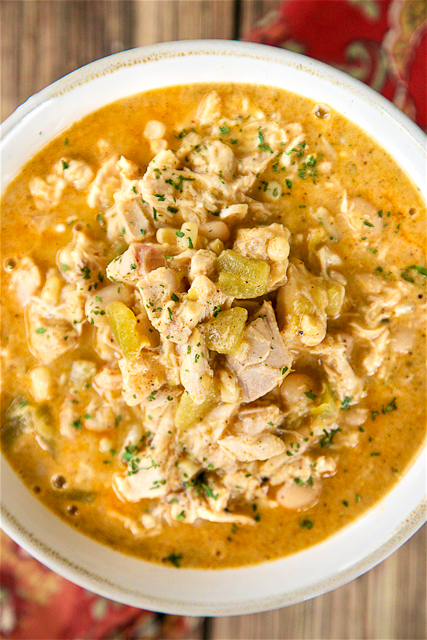 White chili is a favorite around here and your version looks very good and hardy. Does the shredded cheese go into the chili? Or on top? It goes in the chili. Enjoy! I made this last night for my ugly sweater party and everybody raved about it. It is so good, lots of flavor! Everybody loved it!! I made this today with already pulled rotisserie chicken I purchased from Costco. I followed the recipe exactly with the exception of measuring the chicken. It was fantastic. I found a spicy pepper jack cheese that gave it the right kick. I made this today and it was YUM- Thank you! I made this today and turned out great-was so YUM! Thank you - will be making again! This turned out amazing!! Used fresh Avocado and Fresh Jalapeños to top it with crisper strips. Thank you!! I can't wait to try this today for the Iron Bowl...WDE! Absolutely delicious, very fast to make and easy. I didn’t have the can of chilies so I put natural jalapeño peppers diced very small and sautéd in butter before with a quarter of a diced onion, it came out great! I just made this last week and it was delicious! I only used one can of beans (that's all I had), added a little more hot chili powder and used Rotel (medium spicy) instead of just green chilis. I made this today. It is cold & icy (strange for Texas) and I wanted to make chili. I'm tired of the same old traditional chili and since I have a niece who is cutting back on beef, I decided to try this recipe. I have never made (or eaten) white chicken chili before. It is AMAZING!!!!!!!!!! I will definitely add this to my special dishes to make! Something new for family parties! Made a big pan of cornbread to go with it and couldn't have been better!!! My niece loved it also! Flavor, texture, everything works!!! yes I was wondering the same thing...in a crockpot? I want to try this for this weekend! Sounds so good! If I wanted to make it and freeze it, would I omit the cheese to freeze and then add it when I am heating it back up to serve? Either way would be fine. Just your preference. Enjoy! Could you make this with ground chicken? I made this today. It was awesome. My son-in-law even asked for the recipe. I'll certainly keep this recipe. Perfect for a chilly rainy day like today. When you say it makes a "lot", can you give me an idea of how much that is? A gallon? I need to make soup for a large crowd and would like to do this one but I'm trying to figure out how many times to multiply the recipe. Thanks so much! If you use leftover turkey, how many cups or pounds of meat do you add? I normally don't make chicken chili. I made it too many times in the past and kind of burnt myself out. However, I saw your recipe and thought it would be quick. It wasn't only quick, but delicious. Thanks for posting. Hi! this recipe is fantastic! I have been making it for a couple of months, and it is now a staple in my household. There is not one person I have cooked it for that hasn’t left it yet. Do you know how many calories would be in a serving? I saw in the comments that you said it makes about 8 to 10 servings, so I was wondering if you had the nutrition facts on it. Thank you. This isn't just a good recipe, it is great. First time trying white chicken chili at home and it exceeds anything I've ever had. Didn't alter the recipe at all and it came out perfect. Made a skillet of cornbread to go with it. Just wish we got more chili-eating weather in Florida.